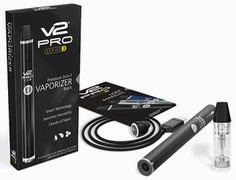 Here at the Full Vapor™ e-cigarette reviews site, we've worked very hard to find you the best e-cigarette e-liquid and flavor cartridges available. We've chosen these based on vaping flavor (how good they taste), vapor production, product quality, product uniformity, etc. Note: Each of the above also offers Zero nicotine options with their flavors. For your convenience, We've listed and described the various e-liquid flavors from each company below. We've also included important information regarding packaging, and how they ensure product safety and freshness (expiration dates, best-by dates, lot number tracking, etc.). Halo Cigs E-Liquid - Damn Awesome Juice! Halo E-liquid - Halo's e-liquid is killer. Some of the best you can get, period. 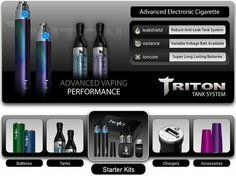 The superior quality of their e-liquids is due to the fact that they started out as an "e-liquid company" first and foremost. 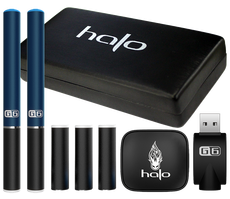 With Halo Cigs, you can expect nothing less than absolutely fantastic flavors that are rich, smooth and satisfying. Their premium e-liquids provide a superb throat hit and produce a truly excellent amount of vapor. 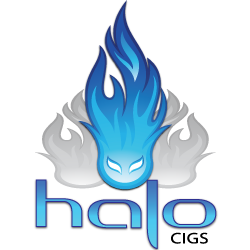 In fact, Halo's e-liquid has been picked as our E-Liquid of the Week three times already! So there's a reason Halo Cigs is the favorite of most seasoned vapers, and we can pretty much guarantee that you'll be extremely pleased with their e-liquid. 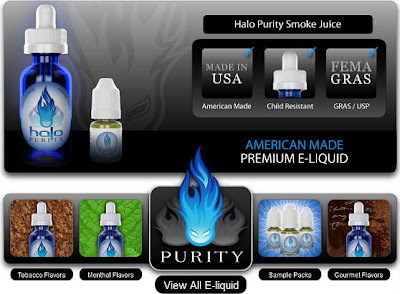 All e-liquid from Halo Cigs is 100% made in the USA, and uses Best-By dating and Lot Number tracking to ensure that your e-liquid is of the utmost quality and freshness at all times. Additionally, Halo uses only FEMA GRAS/USP ingredients, and only the highest quality USP Grade nicotine (with a Certificate of Analysis). More on Halo's e-liquid here. • Shamrock - Mint chocolate. A delicious blend of rich dark chocolate with the enchanting taste of Corsican mint. 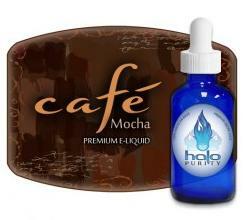 • Cafe Mocha - a gourmet coffee flavored e-liquid with subtle hints of mocha and hazelnut. • Twisted Java - An intense gourmet coffee blend built on a premium espresso base. Layered with peppermint, and topped off with caramel and macadamia nut nuances. • SubZero - Triple the menthol for those wanting a more intense menthol effect. Subtly sweet mixed mint. • LongHorn - a rich fire-cured tobacco blend with a robust tobacco flavor, coupled with Corojo and Cavendish. • Mystic - a refreshing menthol blend with a light sweetness and mixed mint undertones. 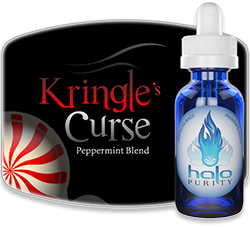 • Kringles Curse - a delightful peppermint flavor with immense vapor production and no underlying tobacco taste. • Belgian Cocoa - a well-balanced Belgian cocoa blend with dry cocoa undertones and a sweet chocolate top note. • Turkish Tobacco - a Turkish blend offering a combination of sun-cured tobacco flavor with a very light semi-sweet top note. • Tribeca - an ultra-smooth blend with definitive tobacco undertones and a semi-sweet top note. • Prime15 - A premium tobacco blend offering the complex nuances of an authentic cigarette experience. Earthy, and with a subtle dry sweetness and hits of cocoa. • Torque56 - a premium e-liquid with unfiltered tobacco flavor and a serious throat hit. • HX3 - an intense blend with a balance of sweet dry tobacco with a very slight hint of menthol. • Captain Jack - A premium tobacco blend named after the famous 18th century pirate, Calico Jack. Somewhat harsh, with a reckless throat hit and a distinct pipe tobacco feel. • Freedom Juice - a subtle tobacco taste, overlaid with a sweet-tasting top note. • Midnight Apple - a blend of rich tobacco, layered with spiced "Granny Smith" top notes. • Bella Valente - a delicate vanilla bean flavor, imbued with a blend of rich Cuban tobacco flavor. • Tiki Juice - a unique tropical flavor built on a spiced tobacco base and with sweet tropical top notes. • Malibu Menthol - a nice, smooth flavor...think of a frozen Piña Colada twisted inside a light menthol wrapper. • Menthol ICE - a clean menthol taste with consistent menthol flavor. 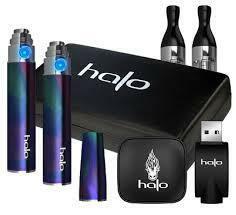 To check out Halo Cigs and their amazing line of e-liquids, go here. NicQuid E-Liquid - Awesome Flavors! With some of the tastiest flavors available, NicQuid is a top favorite of many seasoned vapers all over the world (including us). With quality you can rely on, NicQuid offers some of the most delicious e-liquid flavors you can get your hands on. So whether you prefer tobacco flavors, dessert flavors, menthol flavors or fruit flavors, NicQuid is definitely something worth considering. V2 Cigs Flavor Cartridges - Each V2 flavor cartridge is equal to about 1 pack of tobacco cigarettes. All V2 flavor cartridges are individually sealed in foil-protected blister packaging to maintain freshness and hygiene. Each flavor cartridge pack also comes with an expiration date, so you'll know for sure that your flavor cartridges are 100% fresh. 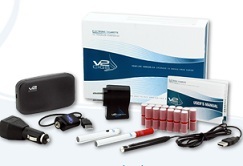 Note: The V2 flavor cartridges are 100% compatible with all KR808-D1 threaded electronic cigarettes! • V2 Red - an American tobacco blend. • Menthol - a crisp, cool and refreshing mint-flavored vape. • Peppermint - a sweet mint-flavored vape (think peppermint & sugar, swirled together with a touch of spearmint). • Mint Tea - the soothingness of Chinese green tea, combined with refreshing mint (think Chinese green tea, infused with mint). • Chocolate - A delicious, chocolate-flavored vape. The rich, creamy milk chocolate flavor will definitely satisfy your sweet tooth. • Cherry - The juicy taste of cherries. Bursting with ripe cherry goodness, like you just left the local farmer's market. • Coffee - a rich, coffee-flavored vape (think American doughnut house java). • Vanilla - a vanilla-flavored vape (think smooth, sweet vanilla). • Congress - a refined tobacco flavor with the distinctive flavor of great American tobacco. In addition, V2 Cigs also offers live e-liquid batch test reports for free via email. These batch tests let you to know exactly what's in your e-liquid. This way you'll know that it's 100% safe and fresh (no other e-cigarette company offers this!). They're definitely setting a new standard in the electronic cigarette industry when it comes to e-liquid quality, uniformity and overall safety. 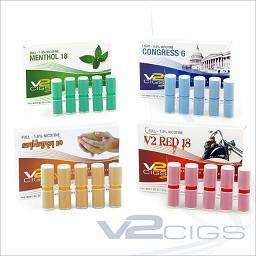 To see the full line of V2's e-cigarette cartridges and flavors, go here. 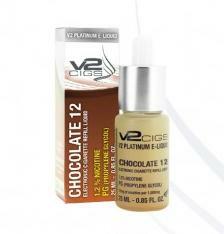 V2 Cigs E-liquid - The V2 e-liquid comes in 25 ml and 50 ml bottle sizes. You can get it with nicotine, or without nicotine (zero nicotine). Each bottle of e-liquid comes in a child-proof bottle and has an easy-to-use dropper built right into the lid, making it simple to use. • V2 Red - an American tobacco flavor. • Menthol - a refreshing mint-flavored vape. • Mint Tea - the soothing properties of Chinese green tea, combined with refreshing mint (think Chinese green tea, infused with mint). • Chocolate - A delicious, chocolate-flavored vape. The rich, creamy chocolate flavor will definitely satisfy your sweet tooth. • Cherry - The yummy, juicy taste of cherries. Bursting with ripe cherry goodness, like you just left the local farmer's market. Curious? Then check out V2 Cigs to get your hands on some of the best e-liquid at the best prices. Volcanoecigs E-Liquid - Great Flavors! 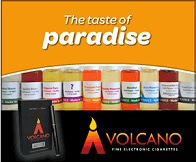 We also recommend Volcanoecigs e-liquid. Their e-liquid is hand-mixed and made right here in the USA, so you can vape with a sense of ease, knowing that you're getting high-quality e-liquid. All Volcanoecigs e-liquid is batch tested to ensure the highest quality and safety. Their e-liquid is also some of the best-tasting e-liquid you can get. It's very yummy! Aloha Apple - a sweet and tart apple flavored e-liquid that tastes like a sour apple Jolly Rancher candy. Choconilla Haze - a delicious mix of chocolate, vanilla and hazelnut. Milk Chocolate - Tastes just like milk chocolate, and all those delicious candy bars you've been hiding. Menthol - a minty, top-of-the-mountain flavor. Very crisp and extremely refreshing. Menthol Burst - Menthol mintyness to the MAX! Just like vaping a fresh breath mint. Coocoo Coconut - a lovely coconut flavored e-liquid. Grape Escape - a grape flavored e-liquid with a sweet, yet mildly aftertaste. Hawaiian Espresso - a coffee flavored e-liquid...subtly sweet, yet nice & spicy like a really good espresso! RY-Four - Ry-Four was the first flavor ever created for vaping, and is a classic mix of tobacco, vanilla and caramel. A true vaping classic! Pearadise - a subtle and sweet pear flavored e-liquid. Cherry Lava - a tasty e-liquid, sure to remind you of a bowl of your favorite hard cherry candies. Surfer Soda - This e-liquid perfectly recreates the flavor of a classic Coca-Cola soda! Waikiki Watermelon - a watermelon flavored e-liquid that tastes like a slice of the juiciest Hawaiian watermelon. BlueWater Punch - a delicious mix of blueberry, watermelon and fruit punch. Vanilla Bean - a sweet and creamy vanilla bead flavored e-liquid. Bonzai Banana - a great candied banana flavor, very close to a banana-flavored runt candy. Hula Punch - a signature flavor, hand-mixed in the Volcano Vapor Bar! Jungle Fruit - Tastes just like Juicy Fruit gum. Oh, so good. Kawika's Kiwi - a perfect blend of sweet and tangy, Kawika's Kiwi tastes just like the delicious kiwi fruit. Kona Coffee - Kona Coffee will transport you to the foggy hills of Kailua Kona. Inspiration for this lovely flavor comes from the big island of Hawaii, where some of best coffee beans in the world are grown. Lahaina Lychee - a truly tropical treat, Lahaina Lychee is a superb mix of sweet and earth tones. Pele's Papaya - a papaya-flavored w-liquid, Pele's Papaya is a spot on recreation of peoples' favorite breakfast fruit. Pineapple Punch - This e-liquid flavor will have your tongue dancing and rolling in the tangy tartness of a north shore grown Hawaiian pineapple. Pipeline Peach - a lovely peach flavored e-liquid that will bowl you over. Red Wings - It's the flavor that gives you wings! Yes, the Red Wings flavor tastes just like Red Bull Energy Drink! Shaka Strawberry - a hint of strawberry that's not overpowering and produces a lot of vapor. If you're looking for a strong strawberry flavor in your e-liquid, this probably isn't the best choice as it's very subtle. Sweet Tart - Tastes just like Sweet Tarts candy...sure to bring a smile to your face. A vaping delight. Tobacco - a perfect blend of flavorings to emulate the taste of a traditional tobacco cigarette grown in the hills of the heartland. Tobacco Pure - Volcano Ecigs Tobacco Pure flavor (derived from actual tobacco leaves) is an excellent representation of a regular analog tobacco cigarette. So check out Volcanoecigs if you want to get your hands (and mouth) on some of the tastiest e-liquids available. Trust me, they're deliciously awesome.